I have been using my iPad Pro 12.9-inch for the last year. when I purchased my iPad Pro, I purchased the Apple Smart Keyboard. This past November 22, after a year of the Smart Keyboard and having read reviews from bloggers and hearing podcasters talk about the Logitech Create keyboards, I decided to get one. What follows are my thoughts and impressions about 12.9-inch Create keyboard. I love using my iPhones and iPads without cases, yet I cannot stand having scratches, nicks, or scuffs so I always use a case or some sort. My iPad Pro, issued to me by my employer, has spent the last year protected by the Apple Smart Keyboard and the Silicone Case. The Logitech Create 12.9-inch keyboard, in my opinion, is on the opposite end of the keyboard spectrum from the Apple Smart Keyboard. The Create fore goes Apple's minimalist obsession and let's their Smart Connector-based keyboard be true to itself. To get a since of the size of the keys, the keys on the Create keyboard are about the same size as those on the Apple Magic Keyboard. The best part about the Create keyboard is that there is actually movement in the keys. If you like the keyboard on the MacBook Air, then I think you will like this keyboard a lot. Since retiring my 17-inch MacBook Pro, the iPad Pro with Create keyboard is a nice on-the-go writing tool. The key caps are a nice size and I can touch type on this keyboard just like I can on my wireless Microsoft (at the office) and Apple (at home). The Create keyboard also has an extra row of function keys that is missing from Apple's Smart Keyboard. The Create also sports backlit keys, a feature that is also missing from their keyboard. The function keys that I find myself using the most are search, backlight brightness up and down, lock, and home. In the position of the Fn key on the Magic Keyboard, Logitech placed a keyboard key, which, when pressed, brings up the iOS 10 on-screen keyboard. I have been using the Create keyboard with three main apps on my iPad - Microsoft Word, Outlook, and OneNote. When I get in a groove, and typing furiously (for me), my personal preference is for the Create keyboard over the Apple Smart Keyboard. For writing in my lap while on the go, I feel that the Create keyboard is the sturdier of the two. The Logitech Create keyboard case is available in five colors: classic red with gold keyboard top, purple, blue with silver keyboard top (the version I purchased), black with silver keyboard top, and black. I have a silver iPad Pro, and I thought that the blue/silver case looked the best. Red/gold was a close runner up. If I had a black iPad Pro, I would have only considered the two black versions. Personal preferences will obviously vary. For as much as I like the Logitech Create keyboard for the 12.9-inch iPad Pro, there are a few downsides to consider. The Create keyboards is big and heavy. It's the price to be paid for being true to itself. Much more so, in my opinion, than the two-piece Apple solution. It's something buyers need to consider if they travel around a lot. For me, the extra bulk is not too much of a problem for me because I don't travel much. Kudos to Logitech for including a wrist rest area, however, it is shallow, and my palms hang off the edge. There are magnets in the wrist rest that will put the iPad to sleep, but they aren't powerful enough to keep the iPad closed. If I pick up my iPad Pro by the top half of the Create keyboard, it will open. While walking around the office with my iPad, there is some minimal movement between the iPad and Create. Because of this, I am worried about the plastic key caps on the Create marking up the glass screen over time. As a result, I felt it was necessary to buy a glass screen protector for the iPad Pro. I have no evidence that the screen would become damaged. It was an emotional response to my desire to keep my hardware looking like it just came out of the box. The one gripe that I do have, that was "fixed" with the Create keyboard for the 9.7-inch iPad Pro, is that there is a loop for holding the Apple Pencil. There is a lot of space where the Pencil loop could have gone. I am looking forward to seeing the loop on a future 12.9-inch Create keyboard. The Logitech Create keyboard for the 12.9-inch iPad Pro is the keyboard for people who prefer a more traditional keyboard experience. I find it delightful to type on and the experience is more like the other keyboards in my life. I also appreciate that Logitech let this be the keyboard that it wants to be - size and weight be damned - and I appreciate it. 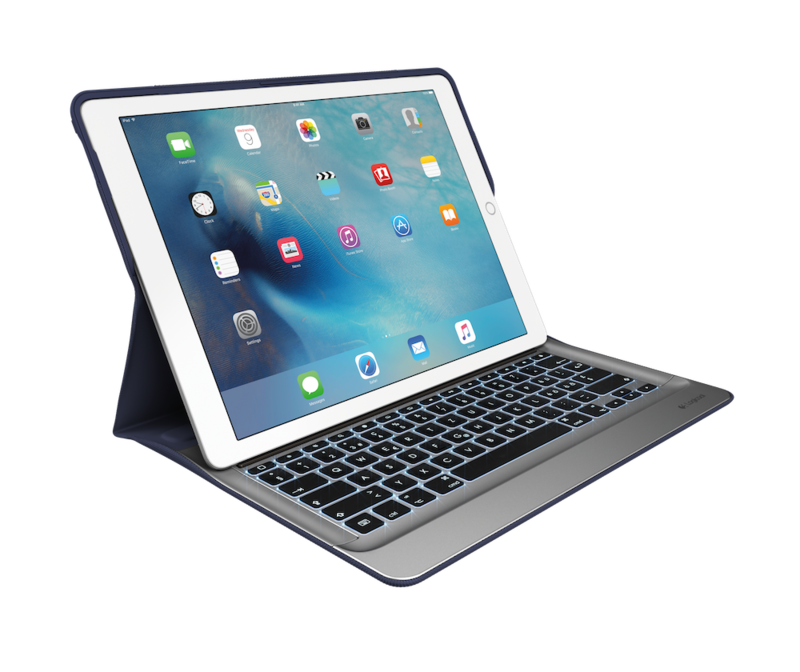 The Logitech Create Backlit Keyboard Case for the 12.9-inch iPad Pro can be purchased for $149.95 from both the Logitech and Apple online stores or in retail stores that sell iPad Pros. 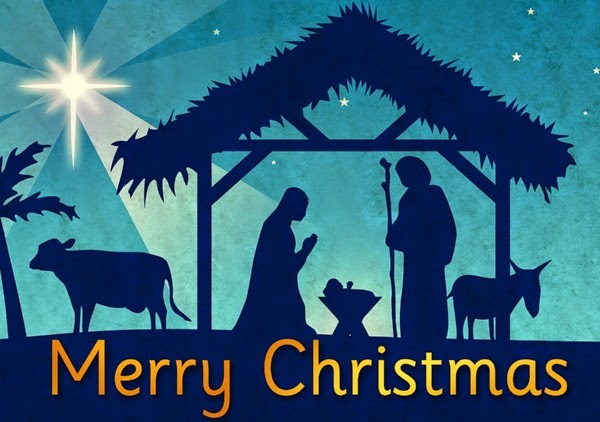 May the new born Christ Child bring peace, love, mercy, and tolerance toward others to our world. Amen. Earlier this week, Apple's wireless ear buds, AirPods, when on sale in Apple Stores. After selling out almost immediately, I finally got mine today. 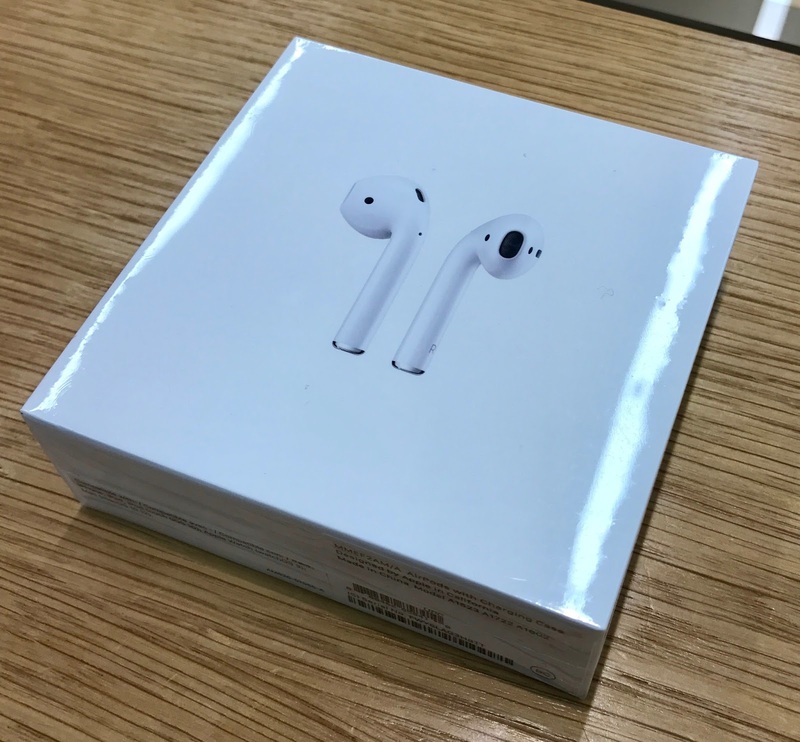 What follows is my story and first impressions about getting my pair of AirPods. 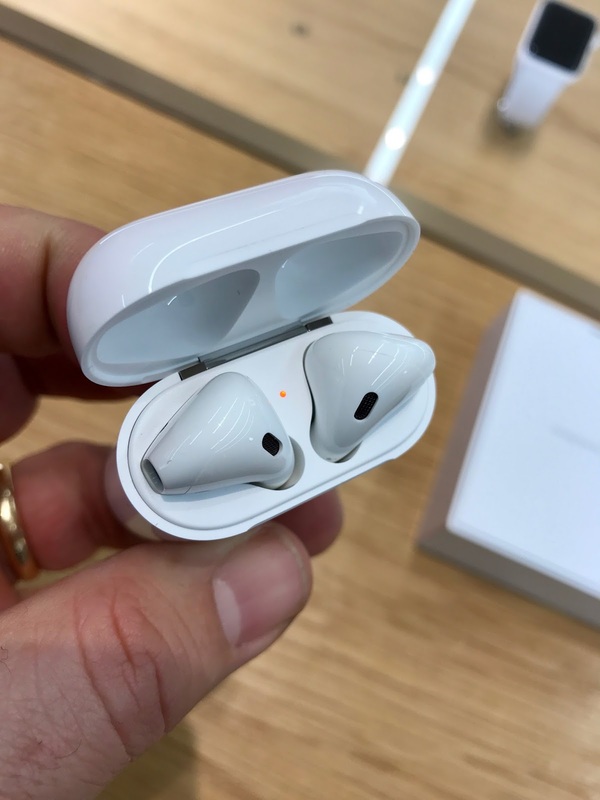 I first learned about Apple's new AirPods wireless earbuds like many of you...while watching a recording of Apple's iPhone 7 event back onSeptember 7th. I was super excited about them and was looking forward to getting a pair to go with my iPhone 7 Plus. 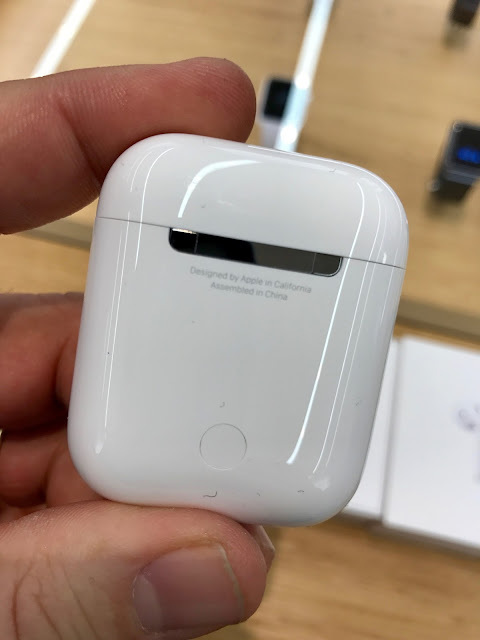 Alas, the AirPods wouldn't be ready until "October". Throw in a "We need a little bit more time to get them exactly right" from Apple PR and you end up with some disappointed customers. Fast forward to December 13, when Apple dropped a press release stating that the AirPods where now on sale at Apple.com. Whoa! I totally missed the press release because, you know, work, and by the time I checked out the online store, AirPods were showing delivery dates three to four weeks out. Having to do the responsible adult thing this past Monday meant that there was no chance of taking the morning off to get in line at one of my local Apple Stores. 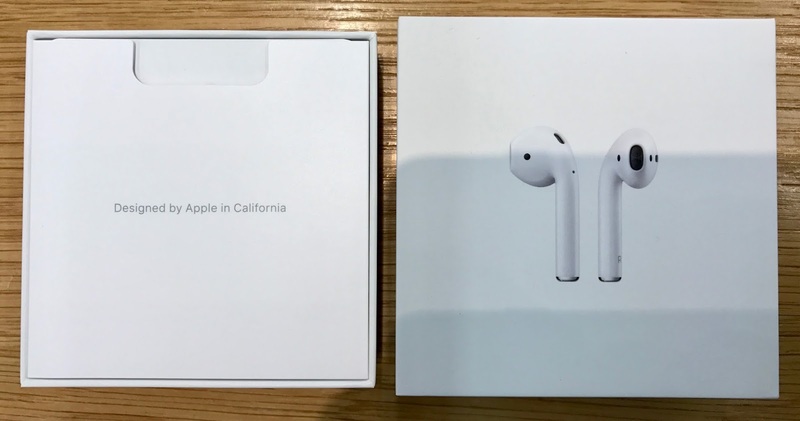 Topping it all off, AirPods are showing delivery dates around mid-February. 2017. Ugh! But my luck changed today, thanks to iStockNow.com! Using their inventory status tool, I was energetically checking AirPod stock in Connecticut, New York City, Long Island, and southern Massachusetts. Yes, I seriously considered driving out of state. Or taking a train down to Apple Grand Central. Or taking my car over to Long Island via ferry. At 3:30pm, I saw that Apple Danbury received some in. The hour drive, by comparison to getting on a ferry, wasn't too bad, but driving back home in rush hour traffic would have been the worst. With AirPods in my bag and my finger hovering over "Buy with Apple Pay" in the Apple Store iOS app, I chose to wait. I decided to wait a half hour to get back to my iMac, and I told myself that if they were still available for pickup in Danbury, I would buy them and go pick them up after dinner. When I checked the status, to my surprise, the AirPods were sold out in Danbury, but were "in" at Apple Trumbull. I hastily changed by order and purchased them online for pick up today. He shoots! He scores! I dropped by Apple Trumbull in Westfield's Trumbull mall. The store was busy, as you would expect, but not super packed. The greeter checked me in, and a few minutes later, Joe was coming over help me finalize my order. Joe recognized my name from the store's grand opening event two years ago. We got to talking and I decided to open my AirPods in the store and set them up. 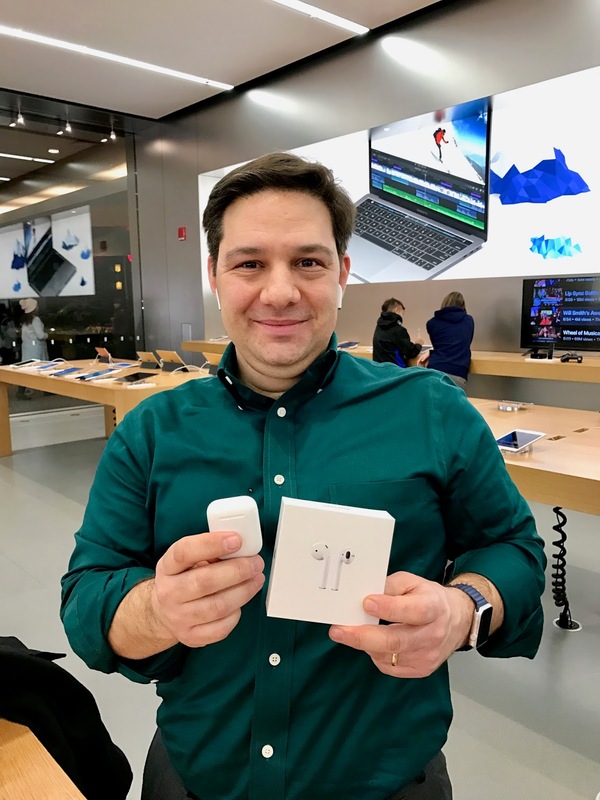 Joe gave me a quick session on how to pair AirPods with my iPhone 7 Plus (Spoiler Alert: Flip open the AirPods case next to your unlocked iPhone running iOS 10) and how to use them. There was a lot going on in the store, so I appreciated him taking some extra time with me for a one-on-one. I also took a few minutes to talk to Mary, the store manager, just to let her know how awesome her staff is. AirPods, are Bluetooth wireless ear buds. The bud part that goes in your ear is styled after the current EarPod wired ear buds that Apple puts in the box with the iPhone. I always thought that Apple's ear buds were comfortable to wear, and the AirPods are no exception. Pairing Bluetooth devices is a real pain in the neck. Apple solved this problem by creating the W1 system on a chip. 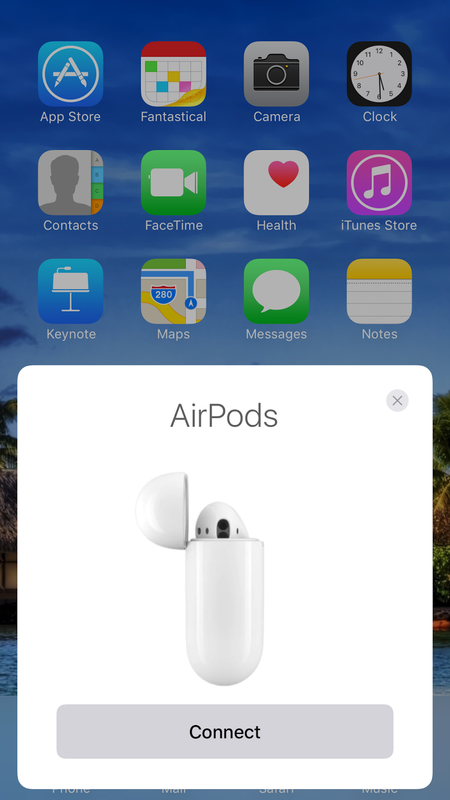 W1 makes pairing AirPods with your Apple devices effortless if that device is running iOS 10, macOS Sierra, or watchOS 3. Just hold the AirPod case a few inches away from your unlocked iPhone and flip open the AirPods case. Boom! For devices like my 4th generation AppleTV, the pairing process is still super simple, but you must press the round button on the back of the case to initiate the pairing process. Because all my Apple devices are signed in to iCloud using the same account as my iPhone, all my devices instantly knew about my new AirPods. That takes so much of the hassle out of trying to use Bluetooth headphones and ear buds with more than one device. I love my PowerBeats ear buds for working out at the gym, but I almost never bother trying to get them to connect to my iPad Air to watch a TV show or movie. 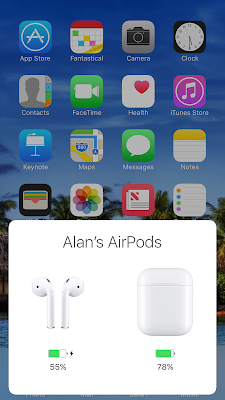 Thanks to W1 and iCloud, using AirPods with all my iDevices is really easy. There are some cool things you can do with AirPods. First off, if you pull one of the ear buds out of your ear, whatever you are listening too or watching will instantly pause. Pop the bud back in, and the music or video automatically resumes. Double-tapping either one of the AirPods will summon Siri. You can ask Siri to raise or lower the volume, skip the current track, or read new messages. Any command that you can issue to Siri from your iPhone, Watch, or Mac will work. In my few hours of playing with them, I haven't found a command yet that didn't work. My daughter Kate wanted to do some Christmas shopping this evening. I brought along AirPods so I could listen to some Christmas music while walking around the local Target. A good song came on, and I pulled out one ear bud and popped it into her ear so we could both listen. We got an aisle length apart and her AirPod bud was still rocking out without any trouble. While connected to my iMac (in my finished basement), I could listen to music on my AirPods two floors away in my bedroom. That's some really great range! You can also use one AirPod at a time. You won't be listening in stereo, but that's perfectly fine while talking on the phone or listening to spoken word content in podcasts or audio books. In just a few hours of using them, I have had a good experience so far. They sound pretty good. Obviously, personal preference will come into play here. I'm not an audiophile, and I like the sound of the wired EarPods. To me, AirPods sound as good as the wired ear buds. They are light weight and are comfortable to wear. I think the best part about AirPods is that there are absolutely no wires to get tangled up in. I won't catch the wire around the arm rest on my office chair. There's no cable to bunch up behind my neck while walking or running. And the AirPods in their case is a smaller package them my PowerBeats in their case. 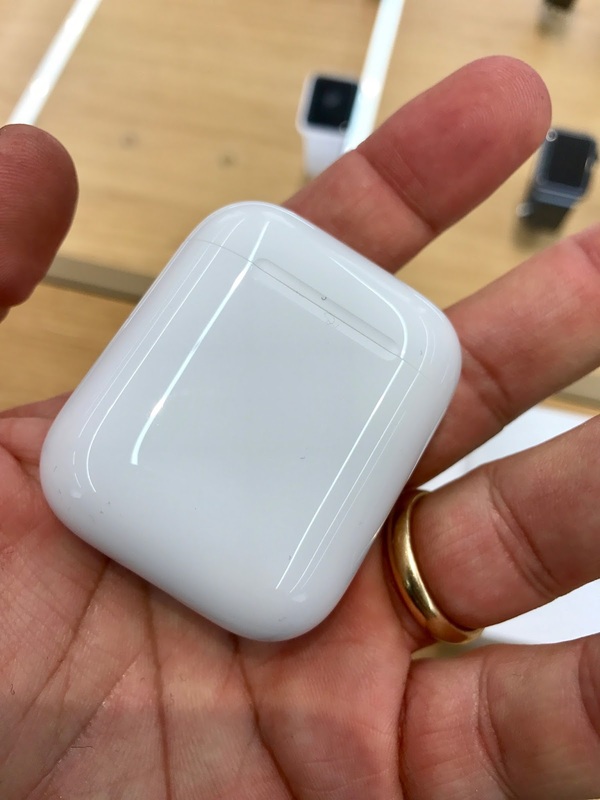 The negatives I can see with the AirPods in my limited amount of testing are the purchase price ($149.00) and the fact that unlike EarPods or Beats headphones, there are no buttons on AirPods. Volume up, volume down, play/pause, and track skipping can only be done via Siri, from your iPhone, your Watch, or another connected Apple device. This wasn't an issue for me. Each time I double-tapped an ear bud, Siri correctly understood and issued my voice commands. Even in a busy Target store. The pause/play feature also worked well just by taking one ear bud out of my ear. 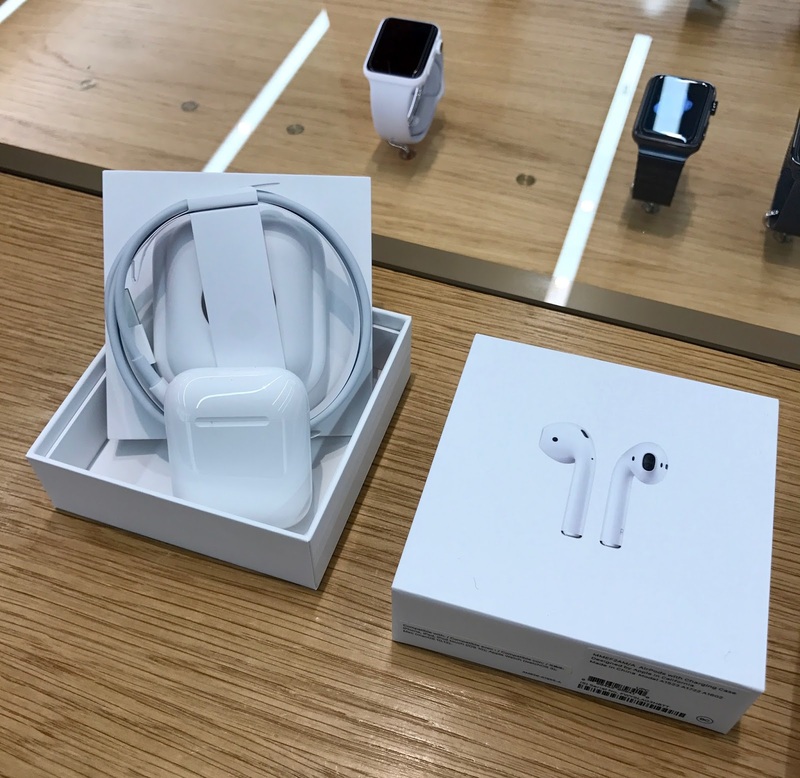 AirPods provide about five hours of continuous use, and are charged when they are placed in their case. The case charges via a Lightening cable. 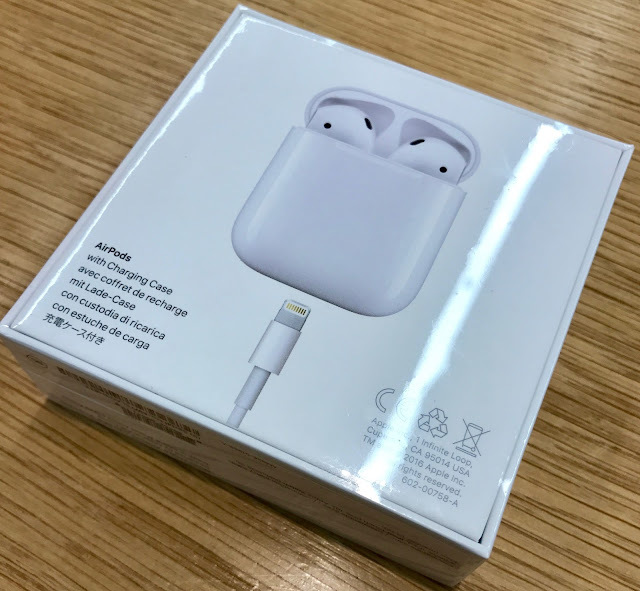 A Lightning cable is provided in the box, however, you will need to provide an adapter, like the one that comes in the box with iPhone. 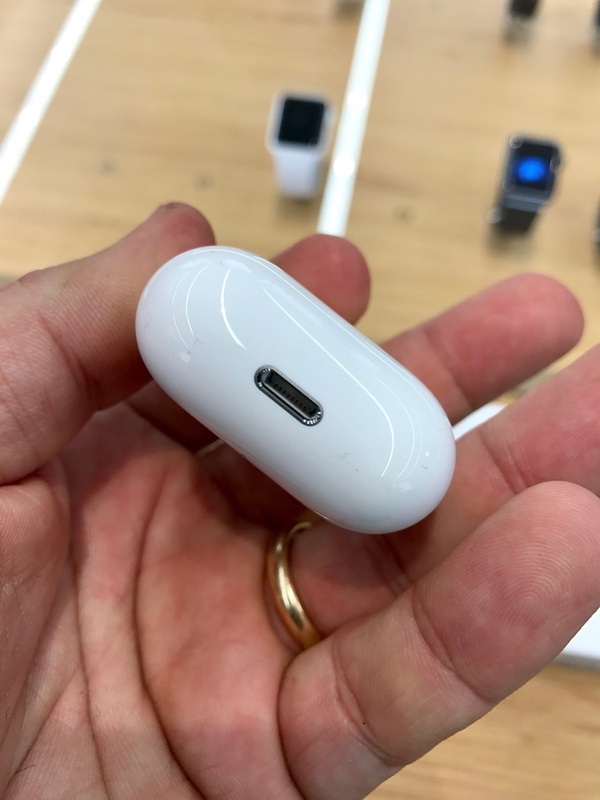 This might be a problem for some heavy iPhone users who may need to charge their iPhone and their AirPods/case at the same time. But let's cut to the chase. Everyone I talked to about the AirPods at work, and Meghan, my Apple loving child, thinks I'm crazy for wanting AirPods because I will promptly lose one and be sad. I baby my Apple equipment. I can't imagine a normal day-to-day situation where I would misplace one or both buds. They sit nicely in my ears. Shaking my head in a vigorous side-to-side "No!" motion does not cause them to fall out. Walking around the mall does not cause them to fall out. Double-tapping them does not cause them to fall out. Lying in bed watching a movie on my iPad wasn't a problem. Heck, I even did 30 jumping jacks without any problems. Every ear is different, so your individual mileage may vary. When I'm not using them, I plan on putting the buds back in their charging case, so I don't expect to misplace either of them. There is no "Find My AirPods" app, so you will need to remember where you put them down. Everything told, I'm super excited to have a pair of AirPods, especially considering how constrained supply is right now. They sound great, the W1 chip makes the Bluetooth pairing process dead simple, and they work as advertised. 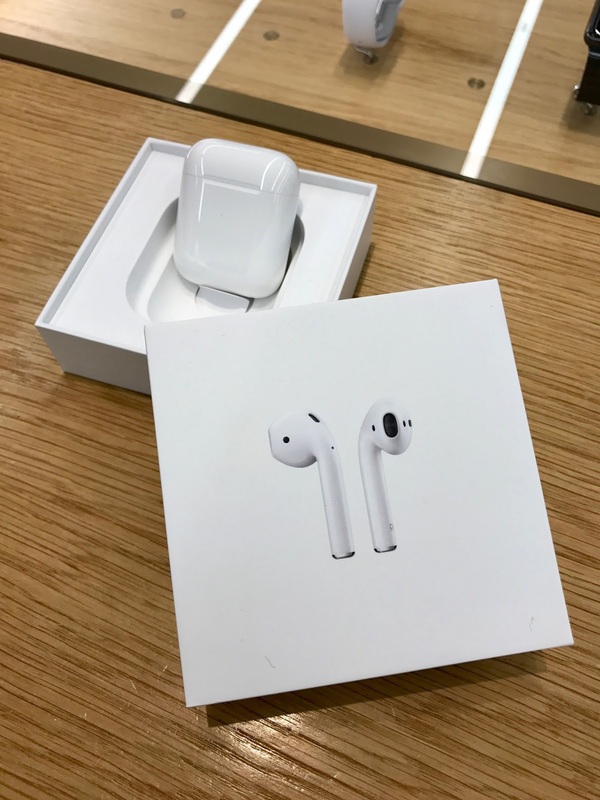 In a word, I would call the new Apple AirPods "magical" and I am going to enjoy using them.